Book a holiday cottage to sleep two on a farm to appreciate total peace with only the sounds of a cockerel or cows mooing in a distant field. The fresh air will help you sleep better and there may be the chance of farm fresh eggs and organic food to cook up for breakfast. A country break refreshes the senses. No rushing about during your holiday, just gentle strolls through the countryside admiring the rural views and stopping to take the occasional photograph. Rediscover nature, butterflies and wildflowers. Go shopping at the local farmers market to stock up on the freshest highest quality produce. There is nothing quite like the real breads found at farmers markets, home-made jams, pickles and treats. A holiday on a farm offers real relaxation. 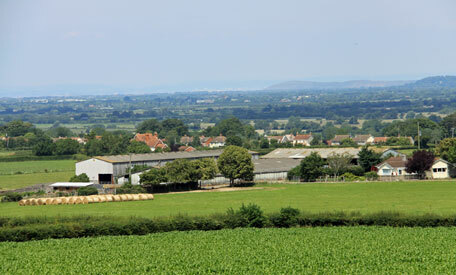 Some farm holidays also offer the use of a hot tub, barbeque or have bicycles to borrow. Quiet country lanes are prefect for cycling. It doesn't matter if you haven't been on a bike for a while, rediscover the simple pleasure of cycling on a quiet traffic free road. There are dedicated cycle paths in many parts of the country and it may be worth checking out if there is one near your farm cottage. A farm holiday offers a genuine escape where you and your partner can hide from the world for a few days. Turn off the mobile phone and 'chill'. A proportion of cottages on farm will not accept dogs because of livestock - do check before you book if you would like your pet to accompany you.